Lens Description: The 15mm f/8 Body Cap Lens from Olympus is a unique wide-angle lens that also serves as a body cap and a unique body cap that also serves as a wide-angle lens. As a 9mm thick body cap, it protects the camera's sensor and internal functions but it's also a pan-focus wide-angle snapshot lens. A lens-protection barrier keeps the lens safe and allows it to stay mounted when the camera is in your bag or pocket. Bring it out to shoot when there is no time or need to mount other lenses. It provides a wide-angle image equivalent to 30mm in 35mm format and a fixed f/8.0 aperture. It has a manual focus front lever and is able to focus as close as 11.8" (30 cm) with a deep depth of field. 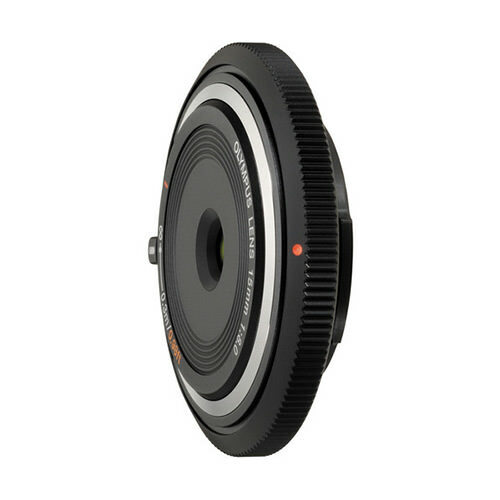 This Body Cap Lens fits Olympus Micro Four Thirds mount cameras.